What's one of the downsides of being outdoors? The lack of light after night fall in my opinion. Suffering as I do from horrific night vision, I struggle once it is dark to do pretty much anything if not sat directly next to a campfire. Searching for stuff in my pack, navigating, not tripping over errant guy lines, not blinding myself with malicious branches and of course finding a discrete location for answering the call of nature before it becomes the primal scream of nature all are if not impossible then flaming difficult without a good light source. I've had many different torches in my time and the style I prefer for camping / the wilds is the head torch. It allows your hands to be free to do whatever you may be needing the light for. I've tried using torches you hold and almost always end up holding them between my teeth (not particularly practical, comfortable or pleasant I can tell you!). The Bear Grylls Gerber Hands Free Torch is a great torch fitted onto an elastic strap to go around your head; it operates with a one-touch button so it can be turned off or on easily. Its lightweight (47g) so you do not feel like it is trying to pull your head off or that it is trying to leave a fetching pattern on your forehead. In fact it is so light that were it not for the light coming from it I may have been concerned I had mislaid it. 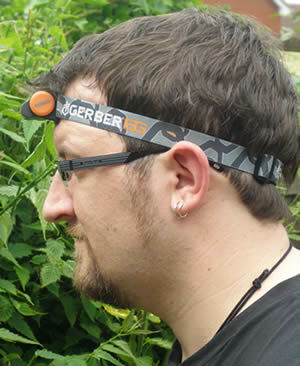 Another feature the Bear Grylls Hands Free Torch has is a loop sewn into the head band to fit a spare battery in allowing you always to have a spare easily accessible. The other merit using triple A batteries is that my pocket torch and also the MP3 player I take camping run on triple A batteries which means I only have to carry one sort of spare batteries rather than a plethora just to keep all my electrical bits running. (I know I said I prefer head torches but occasionally being able to illuminate something or somewhere without having to point your head at it is also useful). A neat trick this Bear Grylls torch has is that it revolves 180 degrees. This means it can be put on a flat surface and directed where ever you so wish. It's bright enough to provide light in a tent or shelter. It's also a useful feature when attempting awkward repairs in bizarre places - engines, cupboards and such like. If I had to find faults with the Bear Grylls Hands Free Torch there are only two. Both of them based on personal preferences. The first is I would like to see a flashing/strobe setting. This is useful for signalling as a strobe is more eye catching than a constant light source. The second is the location of the spare battery loop. I personally did not find it very comfortable, however others who tried it on to humour me found no complaint so it could well just be me. I like the Bear Grylls Hands Free Torch: the lightweight nature of it, the simplicity and the fact it runs on triple A batteries are all winners. I have no reason to believe it will not be a faithful companion on my outdoors exploits. You can buy the Bear Grylls Gerber Hands Free Torch directly from this site.